Augsburg College will honor the calling of one of the United States' visionary civil rights leaders on Monday, January 21, by hosting the 25th annual Martin Luther King, Jr. Convocation. The presentation, "Searching for MLK: A provocative exploration of the legacy of Dr. Martin Luther King, Jr.," will take place at 1 p.m. in Hoversten Chapel and will include thought-provoking archival images, song, movement, and written excerpts from Dr. King. "Each year, the Martin Luther King, Jr. Convocation offers us the opportunity to celebrate the life of Dr. King, and—more importantly—reaffirm our community's commitment to the values associated with his legacy: social justice, peace, and non-violence," said Mohamed Sallam, director of the Pan-Afrikan Center and Convocation committee chair. This year, Convocation curators T. Mychael Rambo and Brian Grandison have crafted a production that seeks to empower each audience member to hold on to Dr. King's dream and to maintain his vision for a beloved community. The Martin Luther King, Jr. Convocation is as pertinent today as it was at its founding a quarter century ago, according to Sallam. "The Convocation is exceedingly important as our community is presented with new challenges," he said. "The planning committee works to address these issues by utilizing different thematic approaches to the event that are relevant on campus and across the Twin Cities." 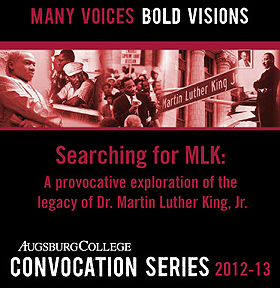 As with all Augsburg College convocation programs, the Martin Luther King, Jr. Convocation is free and open to the public. The Convocation historically has attracted a sizeable audience due to its community partners. Rambo hosted and curated the 2012 Martin Luther King, Jr. Convocation, and he partnered with Grandison for the 2013 event in order to call on his expertise as an actor, director, and writer who has taught classes and led performing arts workshops at universities across the United States. Both men have performed at the Guthrie Theater in Minneapolis and at numerous other venues in the Twin Cities. Share your convocation experience using social media. The hashtag for the Martin Luther King, Jr. Convocation is #MLKConvocation.